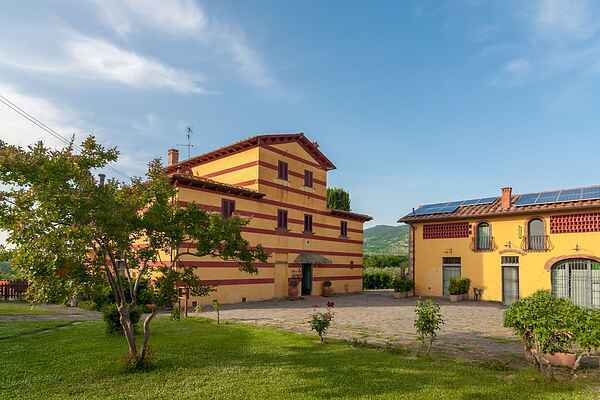 This beautiful red-yellow mansion is situated between the beautiful blue sky and green olive trees. The mansion is situated in the Tuscan hills near the town of Pian di Scò. Apartment Monna Due is located in the main building. The decor is beautiful and tasteful. Each apartment has a private terrace with garden furniture on the spacious square between the main house (the former farm) and outbuilding (former granary). In total there are 8 apartments. The owner lives in the mansion and is always ready to give recommendations on the area. The gated pool is a lovely place to relax, read a book and enjoy the sun. The pool is surrounding by oak trees and olive trees. There is a ping pong table and a barbecue for guests. Besides the olive grove is also a soccer field for children. And in the area you can take walks in the typical Tuscan landscape. The annex is also a restaurant where the owner on request makes typical Tuscan dishes. It is highly recommended to eat here! The manor is located about 30 km from Arezzo and Florence and Siena is easily accessible.